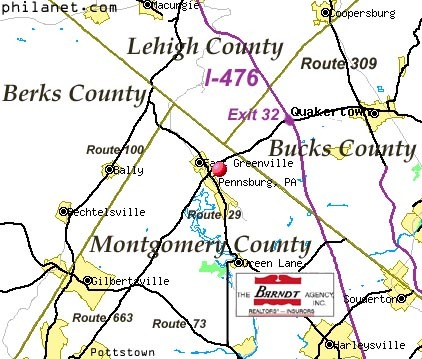 We are located in the northwest tip of Montgomery County in one of Pennsylvania's most scenic areas known as the Upper Perkiomen Valley and are within minutes of Rts. 29, 422, 100, 63, 73 and 309, as well as the Lansdale/Kulpsville and Quakertown interchanges of the PA Turnpike. Merck & Company, Colorcon, Hatfield Packing Company, Harleysville Insurance Company, Brown Printing Company, Knoll International and MOPAC are some of the area's largest employers.� Other easily accessible areas offering substantial employment opportunities are Quakertown, Hatfield, Harleysville, Lansdale, Allentown, Reading, Gilbertsville, Montgomeryville, Horsham, Ft. Washington,� King of Prussia and Philadelphia. There are many places to go and things to do in the area.� The Montgomery County Park System offers fishing, picnicing, tennis, ice skating, sledding, camping, hiking, bike trails and bridle paths.� Skiing, tubing and snowboarding, as well as off-season activities are offered at Bear Creek, Spring Mount, Shawnee and Camelback ski slopes.� Dorney Park and Wildwater Kingdom are popular summer attractions. The area is rich in history, with many sites open to the public, including Valley Forge National Park.� Antique shops and flea markets are abundant, Skippack Village and Lancaster perhaps being the most famous.� Fine dining as well as casual dining can be found everywhere.� Quakertown's dining strip has been noted in "Ripley's Believe It or Not". Philadelphia and the Pocono Mountains are within an hour or so of the area, each offering uncountable activities for all ages.